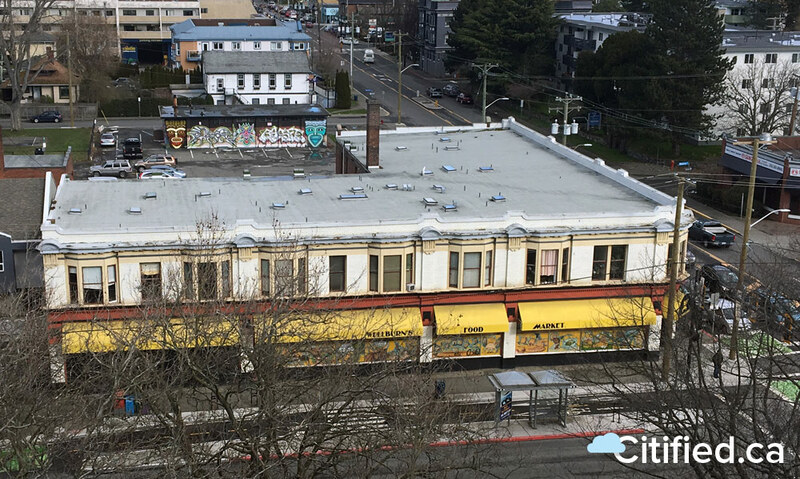 The 107-year-old Wellburns Market building at 1050-1058 Pandora Avenue is the focus of development plans that could see the heritage complex restored and modern residences built on adjacent lands currently used as a surface parking lot. 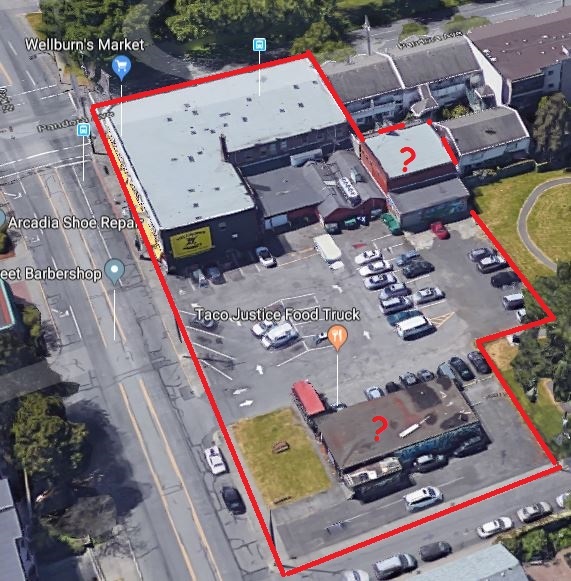 The North Park neighbourhood's Wellburn's Market building and its adjacent surface parking lot have been tentatively purchased by a Vancouver-based real-estate development firm with plans to develop the property, Citified has learned. 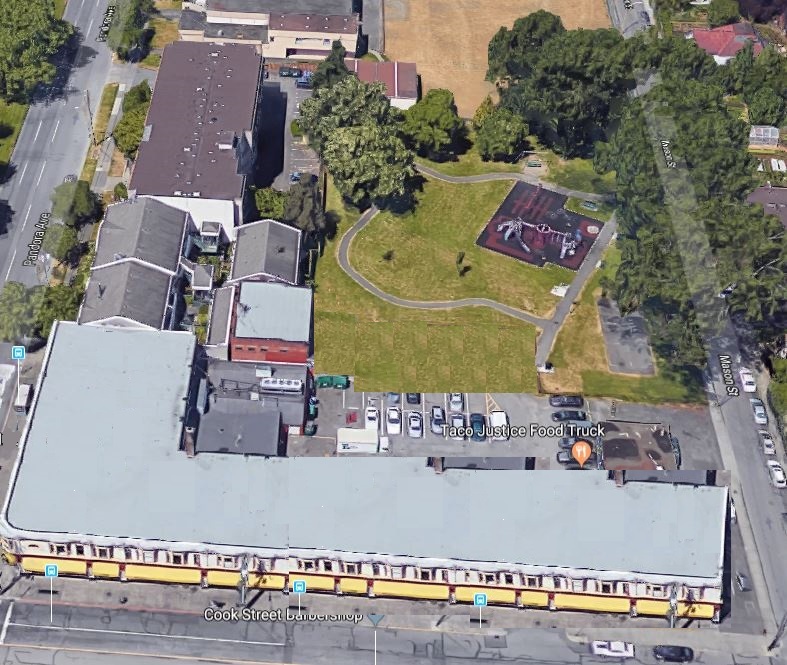 The iconic two-storey heritage registered complex, situated at 1050-1058 Pandora Avenue, was constructed in 1911 as a mixed-use commercial and residential building that 107-years on remains true to its original purpose with a Wellburn's Market as the primary ground floor commercial tenant, and a barber shop with frontage onto Cook Street and rental apartments above. 8-10 stories would be better density, but this is great news for North Park just the same. Of course this will probably kill any plans more substantial than a garden shed. Is that par for the course, for only a 'board' of a neighbourhood association to preview a project before the actual neighbourhood association gets a chance to see it? I think they can consult how they please. The board can then help them decide how best to do a public open. Ah, gotcha. I had never heard of a board-only meeting like that before. Yes that is odd. It might be a good idea though. I am not sure anything that gets vetted by the NPNA board is necessarily going to be better for the process. Look what they managed to do to the 953 Balmoral proposal. But let's face it, any project at this location will receive a huge backlash from the anti-gentrification/BANANAs crowd. BTW, does the property include the cinder-block junker bunker? And is this a separate parcel of land? Back in the 1820s when I was doing this sort of thing it was decided that it would be a good idea for proponents to first meet informally with the neighbourhood association board to show their ideas for a site, even if the plans were vague. Giving feedback at an earlier stage was seen as beneficial for all involved rather than showing the whole association a finished take-it-or-leave-it plan. I guess the shack is included. There is a lot of room for density while retaining that great facade. It must not be destroyed. It's a great urban corner.There are so few remaining urban corners like this outside Old Town. Here is the gis map of the site to show parcel lines. My best guess is that only the area shaded with blue is included. 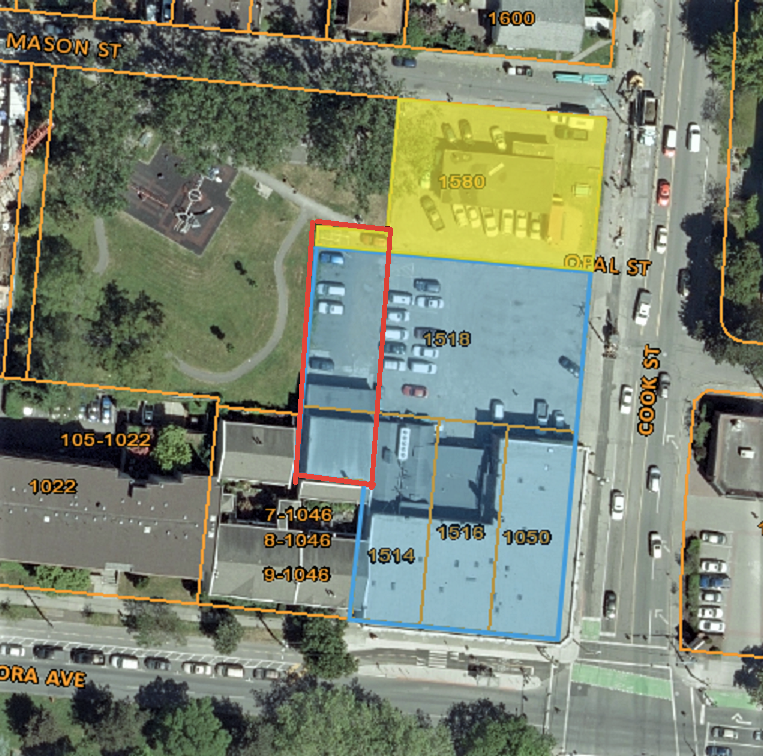 The other parcel to the north (shaded yellow) that you mention is owned by a different party. The entire blue shaded area is owned by one party. However, it is entirely possible that both parties have agreed to sell and will be included in the development. Edited by tiger11, 28 April 2018 - 10:28 AM. Right, the original listing included the blue parcels. ...My best guess is that only the area shaded with blue is included. 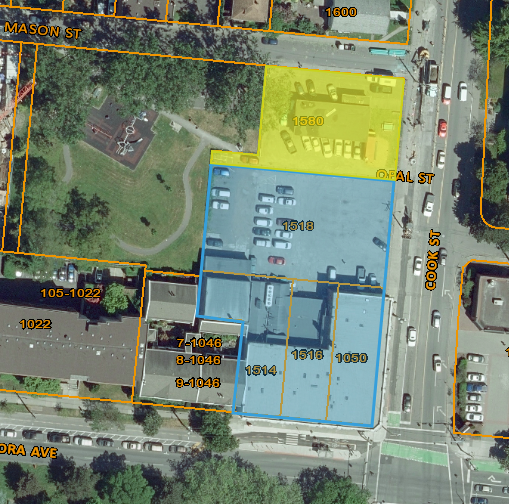 The other parcel to the north (shaded yellow) that you mention is owned by a different party. The entire blue shaded area is owned by one party. However, it is entirely possible that both parties have agreed to sell and will be included in the development. If all parcels were included I think a project that stretched along the entire Cook Street block, more or less continuing the existing retail frontage would be great. I'd expand the park into the area I have outlined in red to create more of a buffer with the new development. A very crude approximation of the Cook Street facade. I don't think it should actually match the Wellburn's architecture, rather honour it in scale and rhythm. The more emphasis on the traditional urban feel the better here IMHO. Edited by Nparker, 28 April 2018 - 11:21 AM. Prefer to see three distinguished buildings/styles here: the old building, something else on the parking lot, and something else again on the Mason St. corner. So would they be putting any additional levels on the old building? ...So would they be putting any additional levels on the old building? Something tells me no for a couple of reasons. I doubt the original structure could withstand any additional weight without pretty much obliterating all but the facade, and I suspect that is not desired. Secondly, I think the ONLY way this will get past the NPNA (and the North Park anti-gentrification crowd) will be to preserve the existing structure as close to its original form as possible. I am totally fine with this as long as sufficient density is allowed on the rest of the property to ensure viability. I think it should be the podium but maybe that's just me. Also the the neighborhood association does not actually have any legal authority. ...the the neighborhood association does not actually have any legal authority. But they do have an inexplicable pull with some residents and members of city council. If the NPNA doesn't like the proposal they will certainly make a lot of noise and ill-will for the developer within the community. Their actions during the St. Andrew's School proposal were deplorable. Which Vancouver developer is this? Yesterday was the deadline for the purchase to close; does anyone know if it was finalized? I believe the purchase did close and the developer is District Properties Group (the developer of the Scott Building project at Hillside and Douglas).